What is the value of an artificial intelligence (AI) in advancing justice in the courtroom? “‘Judge Rui’ 睿法官 uses artificial intelligence to simulate real judges’ thinking to complete a series of accompanying and precise judicial trial affairs, and supports judges to put more time and energy into the judicial trial work. For example, Judge Rui can automatically sense the judge’s behavior information, collect information in real time, grasp the habits and rules, help the judge to automatically archive the file, automatically fill in the case information, carry out the file review, sort out the focus, automatically create and generate the judgment document according to the case, give sentencing suggestions, automatically generate court trial outlines, automatically remind laws and regulations during court trials, and uses court-recognized speech recognition as if it were an online senior judge assistant. Judge Rui has won widespread recognition from users and the legal profession,” comments Shao Xue 邵学, founder and Chairman of Beijing Thunisoft 华宇软件 (SZSE: 300271). With these intelligent support in the next-generation AI platform “Wisdom Court” 智慧法院 launched since May 2018, at least 75% of the judges’ pre-trial reading time can be reduced, and the case recommendation matching can be increased from 20% to 90%. The modification time was reduced from 56 minutes to eight minutes, and the information integrity of the trial record was increased from 30% to 100%. More than 70% of the trial text can be automatically generated and more than 80% of the sentencing accuracy analysis can be provided to the judge to increase productivity. The AI case handling system also increased the efficiency of prosecutorial handling by more than 30%. The handling time of dangerous driving cases was shortened from 1 hour to 10 minutes, and the information input volume was reduced from 4,000 words to 100 words; the handling time of theft cases was shortened to 30 minutes from 3 hours, and the amount of information input was reduced from 5,000 words to 400 words. Readers who want to learn more about the five major technological breakthrough capabilities provided by Thunisoft’s AI platform can find out more in the main story after the intro. Thunisoft is China’s #1 software/AI leader in Smart Judicial Court 智慧法院, commanding over 50% share of the more than 3,500 courts in China of which ~1,800 are using Thunisoft’s software platform, solving the high-value problem of making judicial proceedings more efficient, handling a rising number of civil and commercial cases with the growth rate of new cases accelerating to 25% in the recent years, and relieving judges’ massive caseload. there are more than 85 million cases nationwide to be handled by judges, while there are only 120,000 judges in the country which has been reduced from 210,000 after the reform in the number of judge posts. Thunisoft has benefited from the long-term development in national judicial reform and judicial disclosure to promote the rule of law. The informatization of the court has entered a new era stage from information recording and work circulation (Stage 2.0) to the depth analysis and utilization stage based on data and knowledge towards the direction of supporting decision-making by utilizing AI and big data. The investment in the cloud transformation of government and judicial court affairs to be interconnected and interoperable nationwide will be accelerated, and the coordination of the public legal services will be promoted from top (central government) to bottom. Each generation of Thunisoft’s court information management and AI & Big Data solution has been adopted by the Supreme People’s Court and Thunisoft leads the industry standards and maintained its #1 leadership for 11 consecutive years. The Supreme People’s Procuratorate requested that only IT developers who obtained the ‘Single Qualification of Computer Information System Integration Software Development involving State Secrets’ issued by the State Secrecy Bureau can be eligible to engage in the development and service of the application software of the procuratorate and Thunisoft is one of such rare few qualified tech companies. Customer stickiness is very strong. Once a software system has been procured in the Supreme and upper court, it will be easily rolled out at the grassroots level in the four-level court system and will not be easily replaced. Top 5 customers account for 15.3% of total sales (largest customer is Beijing Municipal High People’s Court which contributes 4.2% of sales). Thunisoft’s focus and accumulated know-how in the judicial court field has differentiated it from general AI companies such as iFlyTek (SHSE: 002230) to command market leadership as well as to attract giants Baidu, Alibaba and Tencent to forge strategic business partnerships (Alibaba in Dec 2018 and Tencent in July 2018) to develop new technology and applications, such as the Thunisoft-Tencent Micro-Court mobile electronic litigation solution 微法院 via WeChat. “Thunisoft also powered the national promotion of the Micro Court mobile electronic litigation solution to provide better litigation support for the national courts, provide more convenient litigation services for the public, and make greater contributions to building a Wisdom Court and building a rule of law in China and achieving the last mile judicial convenience to let the masses feel the sunshine at zero distance 零距离感受阳光司法. The Thunisoft-Tencent Micro Court via WeChat has since spread all over the country in 13 provinces, including Beijing, Tianjin, Hebei, Shanxi, Gansu, Qinghai, Xinjiang, Heilongjiang, Liaoning, Inner Mongolia, Henan, Jiangxi, Yunnan. More than 500 People’s Courts have opened Micro Courts. The open and transparent judicial procedure is an important way to achieve justice. The Thunisoft-Tencent Micro Court provides a series of judicial contents such as judge documents, commutation and parole information, execution information, and court announcements. The disclosure of judicial information has effectively guaranteed the people’s right to know, participate, express and supervise. The Thunisoft-Tencent Micro Court provides basic litigation services such as mobile filing, delivery and receipt, payment, evidence exchange, online trial, contact with judges, etc. for the parties and litigants. Auxiliary functions include: litigation template writing norms, jurisdictional recommendations, litigation fee calculation tools, litigation risk assessment, legal and regulatory inquiries, intelligent assistants and other functions. Among them, the intelligent assistant Xiaoyu can provide the parties with the pre-litigation, prosecution, and post-suit full-process, personal intelligent litigation services, answering the litigant’s litigation questions through human-machine dialogue, guiding the parties to conduct pre-litigation risk assessment, and helping the parties generate complaints, etc. ; and use the intelligent case-like query function to help the parties find cases that are close to their own cases and establish reasonable expectations for court decisions. Using the Thunisoft-Tencent Micro Court to conduct litigation can help alleviate the masses’ complaints, save litigation costs, and truly realize the last mile of getting through the judicial convenience,” adds Chairman Shao. Zhou Qiang 周强, Party Secretary and President of the Supreme People’s Court and Chief Justice, stressed at the 2017 National Court Informationization Work Conference the importance of establishing the Wisdom Court provided by Thunisoft: “The Wisdom Court relies on modern artificial intelligence integrated with the judiciary to serve the people, justice, and adherence to the judicial rules and systems. Reform and technological change are combined to support judicial trials, litigation services and judicial management in a highly informatized manner to realize the organization, construction, operation and management of the People’s Courts that are fully operational online with full-scale intelligent services.” On March 12, 2017, the Fifth Plenary Session of the 12th National People’s Congress held its third plenary meeting. Zhou Qiang made a report on the work of the Supreme People’s Court, proposing that the People’s Court will speed up the construction of the Wisdom Court and strive to provide more high-quality judicial services. In May 2017, the Supreme People’s Court issued the ‘Opinions on Accelerating the Construction of Wisdom Courts’, explicitly requiring the use of big data and artificial intelligence technology to provide accurate and intelligent services on demand to promote the modernization of court trials. In April 2018, the Supreme People’s Court held the fifth cybersecurity and informationization work conference of the National Court. Zhou Qiang emphasized again that the construction of the Wisdom Court should be further promoted and the trial system and trial capacity modernized. In July 2018, the Supreme People’s Procuratorate issued the ‘Guidelines for the Wisdom Inspection of National Procuratorate (2018-2020)’, stating that the main task is to comprehensively build a smart inspection application layer ecology centered on case handling, based on safety and reliability. Wisdom Inspection supports intelligent sharing data layer ecology. In July 2018, the Ministry of Justice held a video teleconference on network security and informatization work, requiring that the system of ‘digital rule of law and smart justice’ be initially established by the end of 2019 to form a big data platform sharing and a large system of governance. In China, government policy influence is a risk that can make or break companies. Take for instance the new policy that took effect on the week of 18 Jan 2019 in which non-bank payments companies must place 100% of their customer deposit funds under centralized, interest-free accounts as Beijing moves in to rein in financial risks. This new policy effectively means the end of the era in which Tencent’s WeChat Pay and Alibaba’s AliPay can make handsome interest returns on client money by holding pre-paid sums from buyers for a short period of time before transferring the money to merchants and earning interest by depositing customer money into bank accounts. We are surprised that this major news and the impact on Tencent and Alibaba was not widely reported. Thunisoft has been an integral positive force and a long-term winner under the national grand strategy in promoting and advancing quality judicial and public services with important social service responsibilities. Thunisoft also owns a 37.5% stake in Huayu Yuandian 华宇元典, a B2C SaaS (Software-as-a-Service) platform (www.chineselaw.com; www.ailaw.com.cn and legalmind.cn) for lawyers to provide data services such as legal regulations and case intelligent retrieval, judicial big data analysis, and information related to litigation. Registered lawyer users have grown steadily to over 20,000 (out of the 300,000 practicing lawyers in China), covering 31 provinces, and accounts for more than one-third of the total number of high-frequency practicing lawyers in China. More than 10,000 legal teams have conducted case management on the lawyer platform. On April 8, 2018, Thunisoft signed a Business Strategy Cooperation Agreement with Peking University Yinghua 北大英华 and purchased a 25% stake in Peking University Yinghua. The ‘Peking University Magic’ 北大法宝 database developed by Peking University Yinghua has become an excellent brand of legal information and an indispensable tool for legal workers. The users coverage include the National People‘s Congress Legal Work Committee, the State Council Legislative Affairs Office, the State Council agencies and other central institutions and corresponding local institutions, about 50% of the courts and 45% of the procuratorates in the country. Thunisoft also utilizes the software platform and know-how accumulated in the courts and procuratorates field to expand in the judicial administration industry (e.g. jails) and enterprises. In May 2018, Thunisoft has joined hands with a number of insurance companies and launched a comprehensive online management platform for property preservation 保全通. In the initial two months since its launch in Beijing, online application for property preservation account for nearly 30%. Over 100 courts in Henan, Hubei, Anhui, Jiangsu, Yunnan and other places have officially launched, and the growth rate of users has exceeded 60%. In August 2018, Thunisoft‘s collaboration OA software subsidiary Wanhu Network (www.whir.net) joined hands with Alibaba’s enterprise communication and collaboration platform DingTalk 阿里钉钉 to introduce Medical Management Cloud 医管云 and Medical Collaboration Cloud 医共云 as part of the Alibaba DingDing-Wanhu Future Hospital 阿里钉钉-万户未来医院. In 2016, Thunisoft expanded into food and drug safety information and inspection field by acquiring a 49% stake in Huayu Jinxin 华宇金信 for RMB 183 million (www.hangyjx.com). In Aug 2017, Thunisoft completed the acquisition of 100% equity of Lianyi Technology 联奕科技 (www.ly-sky.com) for RMB 1.488 billion to expand into the digital smart campus business. Lianyi has successfully provided information services to more than 700 colleges and universities and more than 10 million teachers and students; its market coverage is 12%, ranking top three in the market. Thunisoft was established in 2001 by Chairman Shao Xue who is the largest shareholder with a 19.91%, of which ~6.53% are pledged to repay the funds raised to acquire Lianyi Technology. Shao was the CEO of Ziguang Tianhua Electronics, Tsinghua Unisplendour Software Division, and Tsinghua Unisplendour Software Center during 1993-2001. In 2001, Tsinghua Unisplendour was the main sponsor in setting up Beijing Ziguang Huayu Software (renamed Thunisoft) with the original Tsinghua Unisplendour Software Center’s net assets. On 21 Feb 2019, Thunisoft announced that its FY2018 sales increased 15.48% yoy to RMB2.7bn and net profit rose 30.66% yoy to RMB 498m with profit margin of 18.4%, ROE of 11.7% and ROA of 8.5%. New client contract value has increased 40.39% yoy to RMB3.966bn, of which sales from its legal/judicial business rose 34.63% yoy and its educational smart campus business increased 35.05% yoy. Thunisoft also reported that its year end contract value rose 53.2% yoy to RMB2.66bn, of which sales from its legal/judicial business increased 40.85% yoy and its educational smart campus business rose 96.03% yoy. Balance sheet is relatively healthy with RMB 517m in net cash (RMB522.8m in gross cash, RMB5m in debt) which is around 4% of market cap, and Thunisoft is one of the rare few China companies with little or no capital allocation to “wealth management products”, though it has RMB1.66bn in goodwill, or 32.6% of total assets, mostly from its acquisition of edutech company Lianyi. Thus, instead of investing in the structural long-term regulatory techlash trend of anti-privacy and personal data leakage by shorting video camera surveillance/spying stocks of the dark dystopian future such as Hangzhou Hikvision, Zhejiang Dahua, Wuhan Guide Infrared etc, a better alternative is on the profitable AI innovators such as Thunisoft enabling and advancing judicial legal reform to bring about justice to serve the citizens and the legal community. However, while we are positive on the growth prospects of Thunisoft’s core judicial court business and the smart campus business, there is one primary major risk to Thunisoft. We are very negative on its food and drug safety IT business Huayu Jinxin which we think that a goodwill impairment loss (at least RMB100m) should be recorded, or 1.7% of total assets, given its weak growth performance since being acquired in 2016. More than 10 years after the 2008 melamine milk scandal and the 2018 rabies vaccine scandal, food and drug safety problems in China remain persistent and extremely difficult to resolve and improve. As highlighted two weeks ago, having monitored Thunisoft since its 2011 listing in which share price rose around 250% to the present US$1.926bn in market value, we noted some positive change in its governance recently. On 23 Jan 2019, Thunisoft announced that it will dispose of its 48% stake in a Guangzhou IT company that is listed on the domestic NEEQ OTC board/新三板 for RMB12.32m, having first invested in the firm in July 2013. While the deal may seem small relative to its US$1.926bn market value, loan guarantees and related-party loans were made by the Beijing parent which complicated the relationship. Noteworthy also is that on 25 May 2018, Thunisoft announced plans to raise RMB1.055bn in private share placement (no more than 65m new shares, or 8.6% of total shares outstanding, to no more than 5 specific investors) to fund its new-generation Legal AI Platform construction projects. This plan was approved by the regulator on 1 Jan 2019. The approval is valid within 6 months from the date of approval of the issuance. The pending new shares placement might result in short-term volatility in the share price. 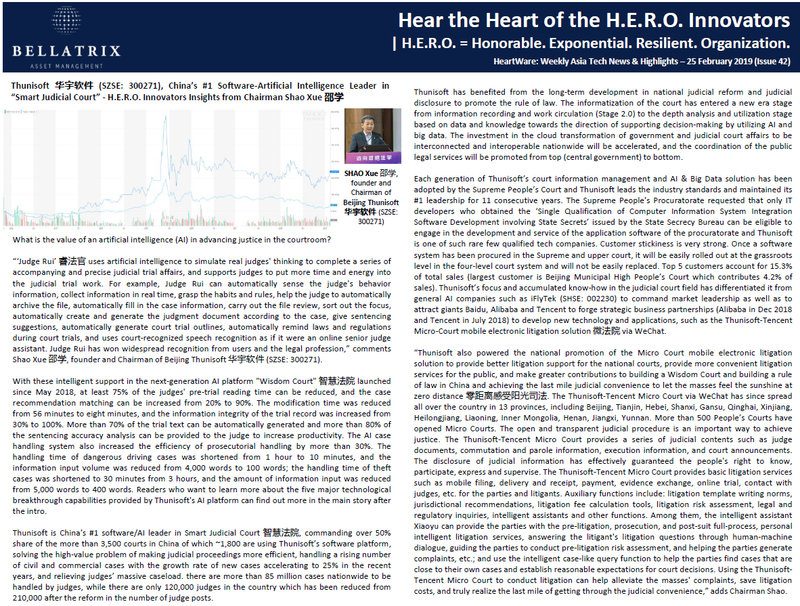 Thus far, of the 62 entrepreneurs and CEOs whom we had highlighted in our weekly research brief HeartWare, around one-third are in our focused portfolio of 40 HERO Innovators, while the rest are in our broader watchlist of 200+ stocks. Our emotional labor of love over the past months in sharing openly our research ideas (to battle-test our ideas by critiques and avoid blindspots in investing) and setting up the proper regulated and transparent UCITS fund structure to protect investors’ interests has deepened our conviction for the positive change that we will make together with H.E.R.O. – and we are now in the final stage of giving birth at end March 2019 to H.E.R.O., the only Asia SMID-cap tech-focused fund in the industry and guarding investors’ interests in the regulated UCITS fund structure with daily NAV & daily liquidity and no exit fees. “We have been focusing on the information construction of courts and procuratorates for many years. We have witnessed the various stages of legal technology from IT to DT, from DT to AI era, and launched generations of products and solutions for customer needs, which has made the company achieve sustainable and steady development. Facing the arrival of the new era of AI, Thunisoft will continue to contribute to the process of building the rule of law in China. This is our responsibility and our mission. After continuous exploration and research, we finally found a path to turn legal artificial intelligence from concept to reality,” comments Shao Xue 邵学, founder and Chairman of Beijing Thunisoft 华宇软件 (SZSE: 300271). Beijing Thunisoft 华宇软件 (SZSE: 300271) is China’s #1 software/AI leader in Smart Judicial Court 智慧法院, commanding over 50% share of the more than 3,500 courts in China of which ~1,800 are using Thunisoft’s software platform, solving the high-value problem of making judicial proceedings more efficient, handling a rising number of civil and commercial cases with the growth rate of new cases accelerating to 25% in the recent years, and relieving judges’ massive caseload. there are more than 85 million cases nationwide to be handled by judges, while there are only 120,000 judges in the country which has been reduced from 210,000 after the reform in the number of judge posts. Thunisoft has benefited from the long-term development in national judicial reform and judicial disclosure to promote the rule of law. The informatization of the court has entered a new era stage from information recording and work circulation (Stage 2.0) to the depth analysis and utilization stage based on data and knowledge towards the direction of supporting decision-making by utilizing AI and big data. The investment in the cloud transformation of government and judicial court affairs to be interconnected and interoperable nationwide will be accelerated, and the coordination of the public legal services will be promoted from top (central government) to bottom. Each generation of Thunisoft’s court information management and AI & Big Data solution has been adopted by the Supreme People’s Court and Thunisoft leads the industry standards and maintained its #1 leadership for 11 consecutive years. The Supreme People’s Procuratorate requested that only IT developers who obtained the ‘Single Qualification of Computer Information System Integration Software Development involving State Secrets’ issued by the State Secrecy Bureau can be eligible to engage in the development and service of the application software of the procuratorate and Thunisoft is one of such rare few tech companies. Customer stickiness is very strong. Once a software system has been procured in the Supreme and upper court, it will be easily rolled out at the grassroots level in the four-level court system and will not be easily replaced. Thunisoft’s key customer group are government legal institutions, including courts, judicial administrative bodies, people’s procuratorates (76.5% of sales and 84.9% of gross profit). Top 5 customers account for 15.3% of total sales (largest customer is Beijing Municipal High People’s Court which contributes 4.2% of sales). Thunisoft’s focus and accumulated know-how in the judicial court field has differentiated it from general AI companies such as iFlyTek (SHSE: 002230) to command market leadership as well as to attract giants Baidu, Alibaba and Tencent to forge strategic business partnerships (Alibaba in Dec 2018 and Tencent in July 2018) to develop new technology and applications, such as the Thunisoft-Tencent Micro-Court mobile electronic litigation solution. Launched in May 2018, Thunisoft’s AI platform uses artificial intelligence to simulate real judges’ thinking to complete a series of accompanying and precise judicial trial affairs, and supports judges to put more time and energy into the judicial trial work. It enables judges to complete eight legal tasks using AI and big data analysis. With these intelligent support, at least 75% of the judges’ pre-trial reading time can be reduced, and the case recommendation matching can be increased from 20% to 90%. The modification time was reduced from 56 minutes to eight minutes, and the information integrity of the trial record was increased from 30% to 100%. More than 70% of the trial text can be automatically generated and more than 80% of the sentencing accuracy analysis can be provided to the judge to increase productivity. In addition to its latest AI platform, Thunisoft’s business collaborative service platform is used for the business needs of business units of the political and legal sectors and its information resource sharing service platform is used for sharing various units of information and data for political, legal, and government agencies, as well as large enterprises. Its products include Instant Messaging Collaboration System, a real-time communication platform; Collaborative Office System, a system for daily work of government agencies; fixed assets management system for the asset management sector, the government, and judiciary and other enterprises; Document Intelligent Editing System, a system for personnel of the law inspection, government, judicial, and other industries; Intelligent Conference Management System, which is used for meetings and conferences; TAS Middleware software, an enterprise middleware product; Transfer Exchange Management Platform to transfer multimedia entity files to the demand prototypes. Thunisoft’s business intelligence platform BI @ Report is used to build data warehouse and decision support systems, as well as for data analysis, statistics, performance evaluation, business warning, data visualization, and other applications; its data acquisition platform i @ Report is used or data reporting, summary, analysis, and other services; and its metadata management platform EsenPowerMeta is used for the full-life control of data assets (http://www.esensoft.com). In 2016, Thunisoft expanded into food and drug safety information and inspection field by acquiring a 49% stake in Huayu Jinxin 华宇金信 for RMB 183 million (www.hangyjx.com). In Aug 2017, Thunisoft completed the acquisition of 100% equity of Lianyi Technology 联奕科技 (www.ly-sky.com) for RMB 1.488 billion to expand into the digital smart campus business. Lianyi has successfully provided information services to more than 700 colleges and universities and more than 10 million teachers and students; its market coverage is 12%, ranking top three in the market. Thunisoft’s smart campus business contribute 14.3% of sales and 8.5% of gross profit; and its enterprise business account for 9.2% of sales and 8.5% of gross profit. Enterprise software account for 46.8% of overall sales, followed by system & services 38.5% and ops & maintenance 14.9%. Overall accounts receivables period is around 105 days and total receivables period is around 136 days. “The continued modernization of the court will be promoted around the four aspects: intelligent trial, efficient execution, automated management, and quality service, including forming a full-service Internet litigation, full-process trial execution elements, and providing users with an all-round integrated judicial trial information resource service on demand, as well as a Wisdom Court 智慧法院 that supports decision.